One way to articulate the promise of interdisciplinary research is in terms of the relationship between knowledge and ignorance. Disciplinary research yields deep knowledge of a circumscribed range of issues, but remains ignorant of those issues that stretch outside its purview. Because complex problems such as climate change do not respect disciplinary boundaries, disciplinary research responses to such problems are limited and partial. Interdisciplinary research responses, by contrast, integrate disciplinary perspectives by combining knowledge about different issues and as a result reduce ignorance about more aspects of the problem. In this paper, we develop this idea and argue that while interdisciplinary research can help remediate damaging ignorance about complex problems, it also creates conditions in which other damaging forms of ignorance can arise. We illustrate this point in detail with three case studies before discussing three implications of our analysis for identifying and managing deleterious ignorance in the context of interdisciplinary research. Piso, Z., Sertler, E., Malavisi, A., Marable, K., Jensen, E., Gonnerman, C., O’Rourke, M. (2016). 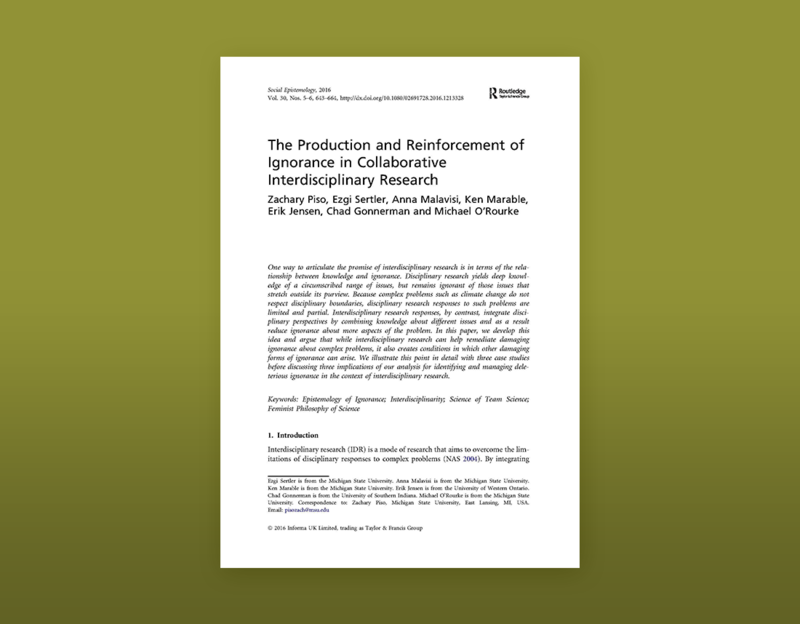 The production and reinforcement of ignorance in collaborative interdisciplinary research. Social Epistemology 30(5-6): 643– DOI: http://dx.doi.org/10.1080/02691728.2016.1213328.